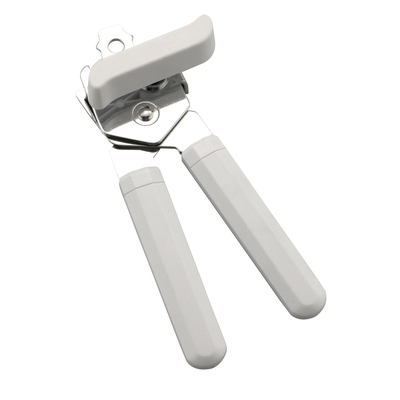 Essential to any busy kitchen or catering environment, our easy to use Can Opener takes the stress and hassle out of opening cans in an instant. Designed for comfortable use and turning its back on tough openers of the past, this functional tool has gently rounded handles for an ergonomic grip while stainless steel blades clip easily to the rim of the can. Turning with just the force of your finger, this opener glides around traditional aluminium cans with ease and reduces the force needed to open your favourite meal classic. And, to add an extra bonus to your purchase, the can opener comes fitted with a stainless steel bottle opener that easily clips underneath bottle caps and pops them open without the need for excessive force. Suitable for hand washing and dishwashers, this reliable kitchen utensil has a compact design that sits within most traditional draws easily. Gompels have everything you could need for your Catering Supplies from Chopping Boards and Cookware through to Fridge Thermometers and Probes.